To work with indexed arrays. To work with associative arrays. To work with two-dimensional arrays. To work with array-manipulation functions. 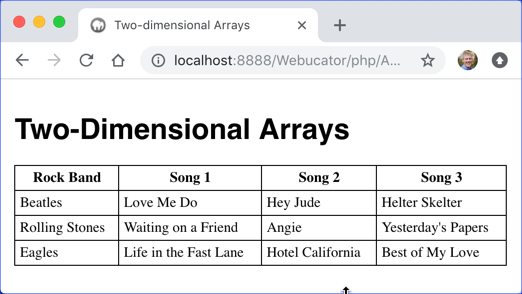 Indexed arrays are similar to tables with a single column. An indexed array can contain zero or more elements. In PHP, like in many programming languages, the first element of an array is in the "zeroeth" position. An array with no elements has a zero length. Now, $beatles will contain 'Connie'. Reading from arrays is just a matter of pointing to a specific index or key. The following code will loop through the entire $beatles array outputting each element to the browser. 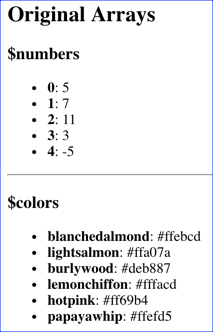 See https://developer.mozilla.org/en-US/docs/Web/CSS/color_value for a list of color names. 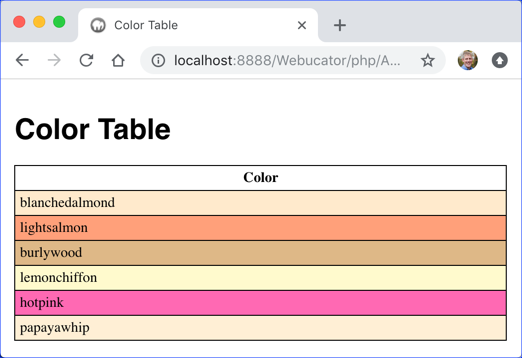 Create an array that holds your favorite colors. Inside of the open and close <tbody> tags, loop through the array outputting a table row for each element. Whereas indexed arrays are indexed numerically, associative arrays are indexed using names. For example, instead of Ringo being indexed as 3, he could be indexed as "drummer". 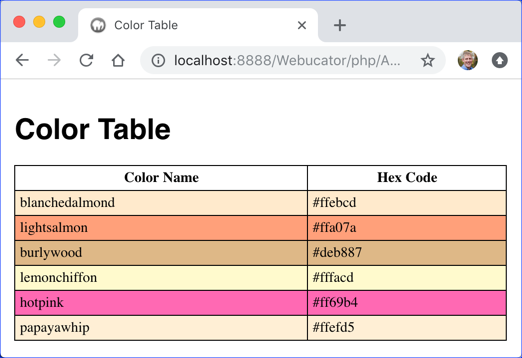 Create an associative array that holds color hex codes indexed by their color names. 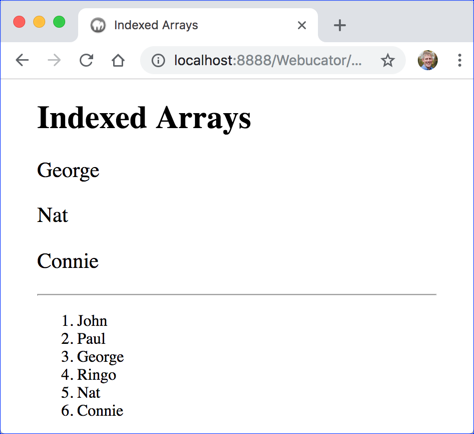 Inside of the open and close <tbody> tags, write code to loop through the array outputting a table row with two columns for each element in the array. 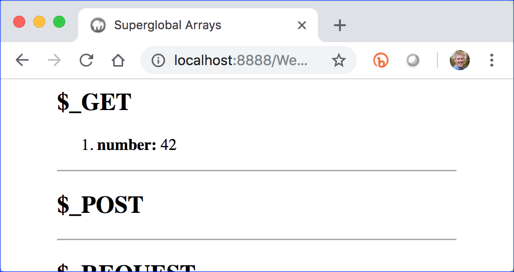 The superglobal arrays are associative arrays. The file below outputs all the contents of the superglobal arrays using foreach loops. Don't worry about the session_start() statement at the top. We'll cover that in detail later in the course. To read an element from a two-dimensional array, you must first identify the index of the "row" and then identify the index of the "column." 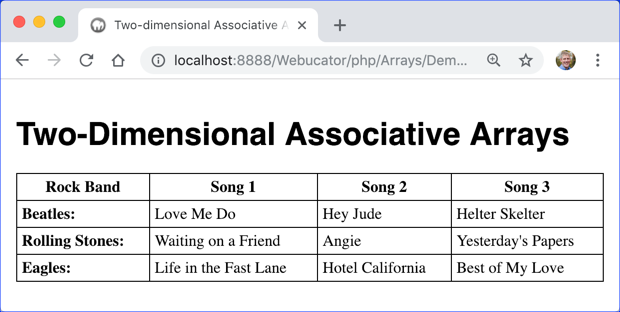 For example, the song "Waiting on a Friend" is in row 1, column 1, so it is identified as $rockBands. Remember that the first row is row 0 and the first column is column 0. The singer1 and singer2 keys are problematic. Imagine we were storing data on a lot of rock bands, some of which only had one singer and others which had several. Imagine then that you are tasked with writing code to list all of the singers from the bands. You wouldn't know which bands had keys for 'singer2', 'singer3', etc. There are many built-in array-manipulation functions in PHP. The full list is at https://www.php.net/manual/en/ref.array.php. In an upcoming exercise, you will practice working with these functions. In doing so, you will need to read the documentation at php.net. One important thing to know about a function is whether it modifies the original array that is passed in in place or creates and returns a new array (or some other object). If the parameter is passed in by reference, then it will modify the passed-in array. If it passed in by value, then it will not modify the passed-in array. The documentation will generally explicitly tell you which it will do, but you can also tell from the function signature. The following two signatures illustrate the difference: Notice that array_reverse() receives the array by value, meaning it won't change the original array, and returns a new array. The sort() function, on the other hand, receives the array by reference (that's what the ampersand (&) does) and returns a boolean indicating whether or not it successfully modified the original array. 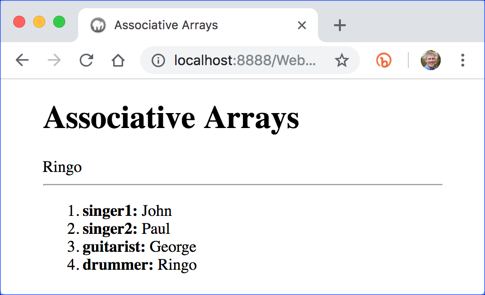 In this exercise, you will practice using PHP's built-in array functions and you will write a couple of your own. You will likely need to read the documentation at php.net to see how some of these functions work. You should test your solutions as you work. An outputArray() user-defined function that outputs an unordered list of the keys and values in an array. Beneath those array definitions, it outputs those arrays using the outputArray() function: Your job is to write code that uses array functions. array_reverse() - Returns a new array in reverse order. Prove it with both arrays. This one is done for you. sort() - Sorts an array in place and re-indexes. Prove it with the $numbers array. This one is done for you. asort() - Sorts an associative array on its values, keeping the key-value pairs together. Prove it with the $colors array. ksort() - Sorts an associative array on its keys, keeping the key-value pairs together. Prove it with the $colors array. rsort() - Sorts an array in reverse order in place and re-indexes. Prove it with the $numbers array. arsort() - Sorts an associative array on its values in reverse order, keeping the key-value pairs together. Prove it with the $colors array. krsort() - Sorts an associative array on its keys in reverse order, keeping the key-value pairs together. Prove it with the $colors array. shuffle() - Randomly shuffles an array and re-indexes. Prove it with the $numbers array. array_keys() - Returns the keys of an associative array as an indexed array. Prove it with the $colors array. count() - Counts the number of elements in an array. Prove it with both arrays. explode() - Splits a string on a string to create an array. A string of spells is provided. Split it into an array on ", " (a comma followed by a space) and assign the result to $spellsArray. implode() - Joins an array on a string to create a string. Join the array you created in the last step on " - " (a space, followed by a dash, followed by a space) and assign the result to $spells. is_array() - Checks if the passed-in argument is an array. And then it should pass the array to outputIsArray(). array_key_exists() - Checks if an array contains a key. array_walk() - Applies a function to every element in an array. There is already a createButton() function in the exercise file. Using that function and array_walk(), create buttons for all the colors in the $colors array.